In late November 2011, Penn State’s trustees faced a leadership crisis as they began to deal with the fallout from the Sandusky scandal. Already weakened by having to delegate his duties in the first few days of the crisis, Chairman Steve Garban was preparing to leave his position as soon as the trustees elected a new chairman in the new year. Vice Chairman John Surma, the driver of the board’s decision to fire former football coach Joe Paterno and the public face of the firing, had no desire to lead. The board’s chairman and vice chairman were set to leave in a matter of weeks, and a power vacuum was emerging. Soon, members would be jockeying for coveted roles in the new Board of Trustees. 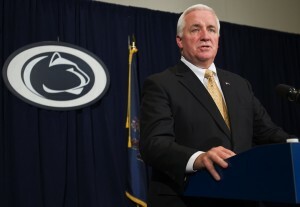 Governor Tom Corbett, who had sought a visible role in the addressing Penn State’s crisis, wanted a hand in choosing the board’s new leader. Six days after the board fired former president Graham Spanier and Paterno, Corbett telephoned Ken Frazier, a trustee and chairman of Merck. He wanted to know: would Frazier take the reins of the 32-member board? With Frazier out of the race for board chairman, the jockeying for the board’s leadership posts continued. On Jan. 6, 2012, Karen Peetz, a trustee from the group who represents business and industry, told the board she would seek the vice chairman’s seat. But there was still no clear choice for the most powerful position – the chairmanship. When the board met on Jan. 20, it elected Peetz and Masser as the trustees’ new leaders. Author’s note: a previous version of this blog post contained information that is currently being reviewed by the Office of Open Records to determine if it must be disclosed. It has since been removed in deference to the review process, and will be re-posted if the OOR determines the records are public records. How seemingly intelligent men and women can make a bad decision on November 9th, and then orchestrate the cascade of bad decisions that followed them for the last two years in an attempt to obfuscate the obvious is beyond imagination. It’s very easy to understand how they got into this position. In the corporate world; as well as in government, it’s very easy to silence the opposition. It’s not so easy to silence motivated individuals who want answers and don’t have to worry about the downside consequences for asking the tough questions and demanding truthful answers. These are arrogant people who put themselves and their agendas ahead of the well being of Penn State University. Stewards they are not. Its time someone speak the truth> this BOT created and drove this narrative for power and profit period. Where is the physical evidence that Penn State was responsible for anything the criminal did at Second Mile charity or at Central Mountain high school where he worked. How is it our BOT claims responsibility for 26 alleged victims paying them 60 million dollars before our administrators have their day in court? Also what about the timing of everything this BOT has done. This whole case stinks and it needs examination> Follow the money. Every person in the great state of PA should be asking the Attorney Generals office to examine BOT members bank accounts. First, thank you Ryan Bagwell for fitting some obvious pieces of this puzzle together. Corbutt deserves to be impeached. And, now, even scarier than our worst nightmares, if Peetz, Frazier, Corbutt, Masser, and Surma made this much of a mess at Penn State what a hell of a mess they must make in business, industry, and government. Not one mention of Spanier, Curley or Schultz concerning the mess that PSU got into ??? What BOT member was on the info. train concerning Sandusky in 2001 ? None. I can think of a few possiblities. Yes, if you believe the crap that’s been written by the media or Louis Freeh, then no one on the BOT had any idea about Sandusky in 1998 or 2001…..
Wow, amazing that they are trying to re-think the info they already released? How did the media miss Surma’s vendetta against Paterno ? and more importantly why are the greedy business and industry/Agriculture BOT members who destroyed PSU’s reputation still in power?